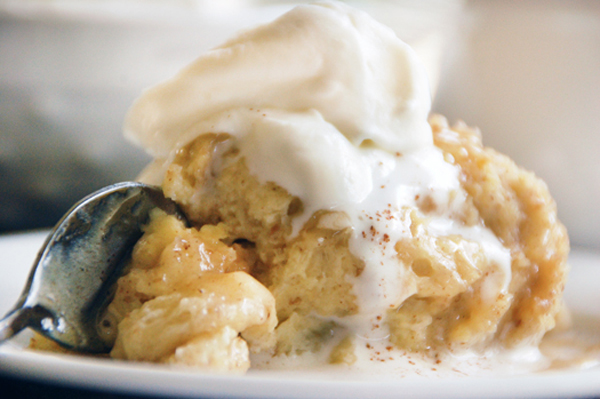 Our warm bread pudding recipe gets the luck of the Irish when paired with a white chocolate stout drizzle. The bold, bitter notes in the stout balance out the sweetness and rich texture of the white chocolate, making this the perfect ending to a St. Patrick’s Day feast. Preheat oven to 350 degrees F. Butter a 9-inch baking dish with two tablespoons of the butter. Add bread cubes to pan, and set aside. For the bread pudding, in a large bowl beat eggs and sugar, and set aside. In a medium saucepan, heat milk, cream, salt and vanilla bean pod and seeds over low heat; steep 10 minutes. Pour a small amount of the milk mixture into the egg mixture while whisking to temper. Continue to incorporate the milk mixture into the egg mixture until well combined; pour over bread cubes, pressing bread gently until saturated. Place pan in oven, and bake 25 to 30 minutes, or until puffed and slightly dry on top. Meanwhile, in a medium saucepan, heat butter, cream, half and half, stout, sugar, vanilla, white chocolate, cinnamon and salt over medium heat. Bring to boiling; reduce to a simmer. Cook, stirring occasionally until thick, about 20 minutes. Remove from heat, keep warm. Stir with a whisk until smooth before serving. For the whipped cream, in a large bowl, using an electric hand mixer with whip attachment, whip heavy cream on medium speed until slightly thick. Add sugar and continue to whip until soft peaks form, about three minutes. Place spoonfuls of the bread pudding on small serving plates. Drizzle with white chocolate stout sauce and top with whipped cream. Sprinkle with additional cinnamon if desired, and serve warm.